1. Take bus 20, 25, 102, 106, 377, 381, 454, or 458, or the double-deck bus Te 12 to Yongdingmen Long-Distance Bus Station to take a coach bound for Baoding. You will arrive at Baoding in around 2 hours. 2. Take metro line 9 or 10 to Liuliqiao Station. Leave from Exit C to reach the nearby Liuliqiao Bus Station, and then catch a bus there to Baoding. 3. Take bus 2, 71, or 678, or Zhuan bus 9 or 76 to Haihutun Stop and then walk southwards for around 100 meters (110 yards) to the Muxiyuan Caihua Bus Station for your onward bus to Baoding. Take bus no. 96 to Keyunzongzhan Stop and then go across the road to the Shijiazhuang Passenger Transportation Center, and then take a 2 hours' bus ride there to Baoding. Upon arrival at Baoding Passenger Transportation Center, transfer to a bus there to Chajianling Village, which is a former military castle in the old days, and the journey would take 3 hours or so. Find a hostel to have a short rest when you get to the village. After that, you may head southwards to the Middle Gate and then walk along the ramparts counterclockwise to tour around the village. After breakfast, follow the ramparts stretching out from the village westwards to go uphill. After passing by six dilapidated watchtowers, the Great Wall turns a right angle and extends to the bottom of a valley, and then continues to crawl up along the hill to the west. You will encounter several relatively well-preserved watchtowers afterwards. Each of them is in the shape of '回' if seen from the air and you can find exquisite patterns of flowers carved above the arrow holes on the walls. When arriving at the tenth watchtower, you need to walk backwards to the south and then go along the other path to the 11th tower, since there is no wall connecting the two towers. 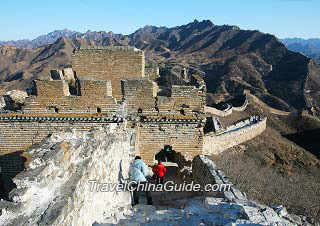 You will get downhill again from the 11th watchtower to the ruins of Shicheng'an Gate via another two towers. 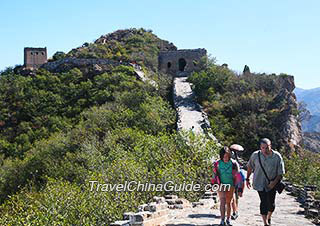 Continue to hike uphill from the gate to the top of the next hill to reach the 17th tower which is also the best-preserved tower along Chajianling Great Wall. After taking enough pictures, go back to the Shicheng'an Gate and head northwards to Yangjiachuan Village. Turn eastwards there and go forward until arriving at a wide highway near the Cierbo Village. Go down the road southwards to Chajianling Village and the whole journey would take around 1.5 hours. After having a big meal at Chajianling Village, please take the return bus to Baoding and then reverse the trip back to Beijing or Shijiazhuang. This 2-day independent Chajianling tour will conclude here.